In order to help our clients reduce product costs, we normally use locally manufactured raw laminates for our PCBs. That being said, we understand that your designs might be made with a very specific material in mind, in order to meet signal integrity and HDI PCB requirements, so we will accommodate your PCB material preferences. We also use North American materials such as Isola 370HR, FR408HR, etc., upon request, to satisfy your engineering needs. We keep a healthy stock of all commonly used materials, and as long as we have your selection in stock, the material will not usually affect the efficiency of our PCB Assembly Process. What separates Bittele Electronics from its competition? Our competition too often focuses only on low costs without any regard to quality and service. Bittele Electronics is dedicated to offering our customers the lowest possible costs as well as the very finest in High Quality PCB Fabrication and High Quality PCB Assembly. When we use substitute materials, we use the best quality substitutes (based on material availability). We avoid using low quality materials. Bittele Electronics uses materials that are the nearest equivalent to North American materials. The following chart explains our material selection philosophy. It shows how we replace materials, as well as the differences between materials specifications as per published data sheets. For Tg 130 in North America, the material used was FR-402, and for Tg 150, the material used was FR-404. However, most of the major PCB manufacturers have now made 370HR their default choice for both cases. Some smaller shops still use FR406 as a replacement. FR402 & FR404 may still be available and some PCB manufacturers may still purchase it, but this practice is not common. Bittele Electronics uses FR406 as our default standard. However, offshore suppliers have substitutes available for FR402 & FR404, which we have listed in the table above. The comparison of these materials with FR406 is not equivalent, but it is more practical. 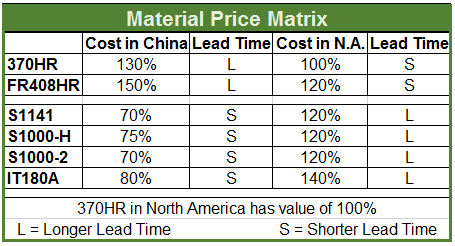 The Material Price Matrix chart above compares materials from both China and North America in terms of price differences and lead-times associated with them. The price is based on general estimation. The lead-time shown is based on long-term logistics trends. Both attributes can vary depending upon the Core Thickness of the materials. We will work with you to create your PCB Stack-Up. We will perform impedance calculations at the conceptual stage as well as the production stage. We will provide stack-ups including Impedance Control if necessary, with various materials upon request to demonstrate the impact that different materials have on impedance. As a part of Bittele’s client-focused Customer Service philosophy, our engineering team works with our PCB manufacturing facilities to communicate to you any material-related issue or concern at all times. Our engineering team is extremely competent and experienced at CAM, methods engineering, and process engineering. In addition to the standard selection of materials listed above, we use the following specialty materials. Please note that at times extra Lead Time may be required for some of these materials. If you have any concerns regarding our material selection methodology or if you have any queries regarding specific materials, please feel free to Contact Us at any time. Our sales team will be more than happy to assist you as well as provide you with information on pricing and/or lead-time regarding any material. Our FAE and engineering team will be more than happy to work with you on creating stack-ups and performing impedance calculations.